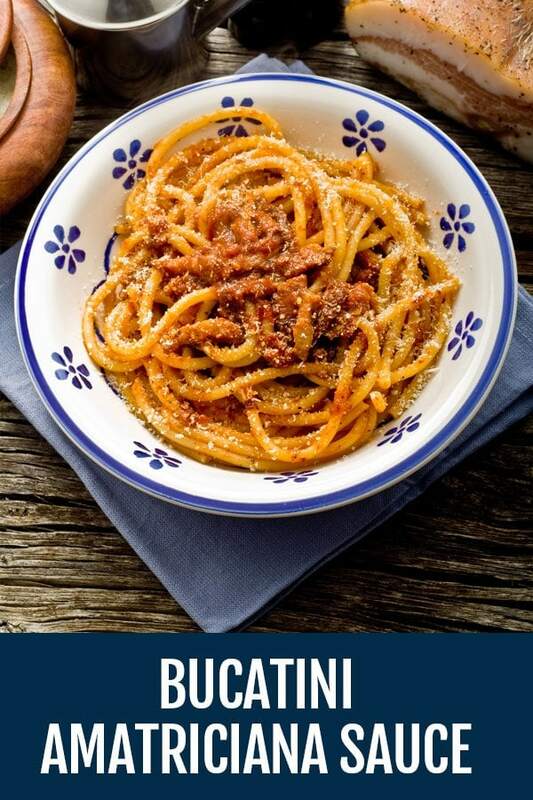 A classic Roman recipe, a first dish representation and celebration of Italian cuisine based on bucatini, tomato, guanciale and pecorino cheese. The interpretations of the original recipe are varied but mainly involve different proportions between these four main ingredients. Pasta all’amatriciana is simple to make, delicious and easy enough that anyone can do it and guarantee excellent results. 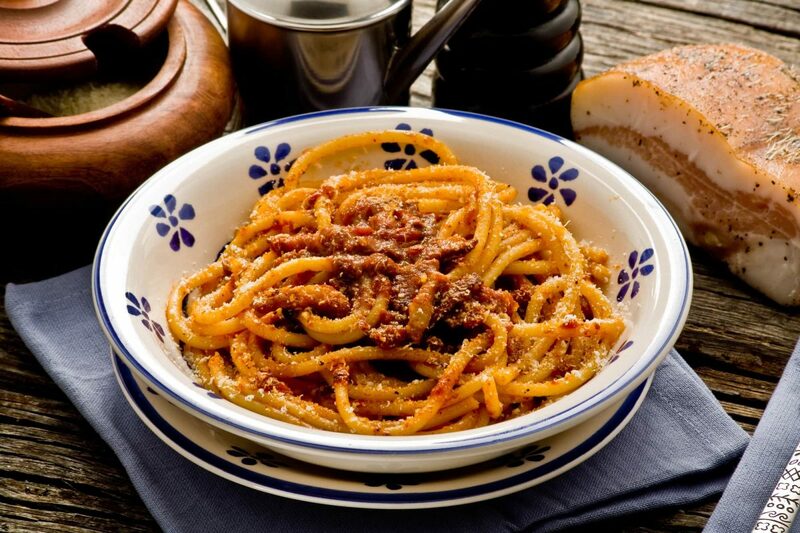 Bucatini all’amatriciana is a starter dish regularly eaten in Roman households, like pasta carbonara, whose recipe has, over time, been tweaked and amended, normally in relation to the proportions and use of ingredients that go into the recipe. Starting from the thickness and shape of the strips of bacon, for example, or the different methods of frying them (without fat, with oil or lard) and how they are simmered (wine, vinegar, or neither). Another small but important variation relates to the choice of pasta, and the varying quantities of meat and pasta used in the recipe. Another point of contention is the amount of fried onion used in the preparation, if indeed there is any at all. 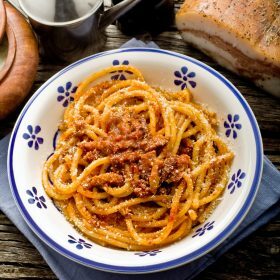 With such a wide variety in the interpretation of what should be a simple recipe it is easy to see why writing this amatriciana recipe is not such a simple matter. In our version of pasta all’amatriciana we propose the use of bucatini, spaghetti or spaghettoni, peeled tomatoes or fresh and ripe tomatoes, a delicate and not too salty pecorino, and finally peperoncino and dry white wine to complete the dish. This traditional Roman dish is an absolute win. Easy and quick to make, try it today. Fresh tomatoes are always recommended and so to start the preparation of the meal, boil them for a few moments in boiling salted water, then drain and cool them under running water. After peeling them, remove the seeds and cut them into fillets. In a pan (preferably an iron skillet) heat the oil and add the guanciale cut into strips about a couple of centimeters long. When it starts to melt, add the pepper. Cook the guanciale until it has browned, then simmer it with the white wine. Let it evaporate, drain the pork cheek and keep warm. In the same skillet put tomatoes that you prepared in step one and cook for the same time of the pasta. Add salt to the boiling water, then add the pasta and cook for the time indicated on the pasta box. When the pasta is almost cooked, add the guanciale to the sauce in the iron skillet and remove the peperoncino. Drain the pasta al dente and transfer it to the pan with the sauce. Remove from heat and add the grated pecorino and fresh ground pepper to taste. Mix well and serve immediately sprinkling your pasta all'amatriciana with more grated pecorino cheese. Grazie Steve! Glad it was a delicious experience!